Guys. To say that I am excited about this build would be an enormous understatement. When I opened the Pottery Barn catalog a few weeks ago my jaw dropped. I saw the prettiest table and HAD. TO. HAVE. IT. So, in typical fashion, I started planning. Here is how she turned out! Check out my Pottery Barn Inspired Dining Table! A. Cost – The lumber total was $101 at Home Depot. See for yourself in the copy of the receipt I shared on Instagram! B. Size – I like em chunky. This one fits that bill. Nearly the entire thing is constructed from 2×6. It’s beautiful. C. Simplicity – I won’t call this a beginner build, BUT we have simplified the plans to allow you to use a regular Kreg Jig and not the HD. My brother-in-law received the plans from me about a week ago (perks of being family 😉 ) and this is his VERY first build. It took him a few days, but he completely nailed it. So, I feel like its totally attainable at any level with the right tools. So, let’s go! As always, I will walk you through the entire build below and you can download and print the FREE plans by clicking HERE! This table uses 2×6 framing lumber. On several parts you will “laminate” the boards together to form the larger looking pieces. To get a really high end look on this piece, I chose to rip all the rounded edges from the boards. I did this using my table saw. This takes a little extra time, but it’s SO worth the outcome. You will run each rounded edge through, leaving you with 5″ width boards. Once you have that finished, it’s time to prep the boards for the legs. I cut the leg pieces next before laminating them together. I did this so that I would be able to add pocket holes to the legs without having to use the HD jig. Each leg is two 2×6 with 1.5″ pocket holes on one side and end of each board. I used my K5 Kreg Jig to make these pocket holes. This is FOR SURE the Kreg Jig model we would recommend starting with. You will thank us 🙂 You can find it on Amazon HERE! And, clamp them together. The tighter you can get them on this part, the smaller your seams will be. BE SURE to attach them the right direction with pocket holes facing out and at opposite ends! While those were drying, I got started on the base of the table. You will actually make two identical base pieces. One will be the actual base that sits on the floor and the other will be the part that supports the table top. You are basically forming the letter “I” on this part. I attached both ends using wood glue and 2.5″ pocket hole screws through the pocket holes. Next, I cut the additional pieces. Each of these will have 45˚ bevel cuts. I used my miter saw for this part. I attached these pieces using lots of wood glue and 2″ finish nails with my Ryobi AirStrike finish nailer. Next, you will cut and add them small squares for each end. I flipped each base assembly upside down on this part. Then, I added wood glue to each end. I attached these squares using 2″ Spax screws. You can use a drill on this part, but I used my new Ryobi driver that I LOVE. It’s called the Quietstrike and I am shocked at how much quieter it is than my other driver. It’s foot pad time! These are small squares cut from a 1×6 that will attach to the bottom of one of the base assemblies. I also used wood glue and 1.25″ finish nails on this part as well. Now back to the legs! I unclamped all the legs and started building each leg assembly. This will consist of two legs and a small 4×4 runner that goes between each leg. This is what they will look like. *Small Note* Some saws will not be able to cut through a 4×4. If that is the case with your saw, you can use a 2×4 for this part and laminate it the same way you did the 2×6 in the above steps! I glued and clamped one leg to the 4×4 to begin with. You will need 4″ Spax screws for this part! These are by far one one of our favorite brand of fasteners. We use them in multiple sizes for different projects. The T-star head is one of our favorite features. You can find out more info on Spax brand HERE. I used my driver to attach the legs to the runner. I put two screws into each side. These screws will be covered in one of the next steps. I attached the other leg the same way. Next, I attached each leg assembly to the base. You will attach these to the base with the foot pads using 2.5″ pocket hole screws and wood glue. You will attach your top base assembly on top of the legs next and the entire pieces should look like this…. Again, you will need to get creative here if your saw won’t make a pass on a 4×4. I would suggest using a 2×4 on this part to achieve a similar look if you get stuck. Be very careful making these cuts on the 4×4 and try to clamp your wood as best you can when you cut it. I cut my 4×4 at the angles noted in the plans. I used wood glue and 2″ finish nails to attach these pieces to the base of the table. The table top is next! I added all my 1.5″ pocket holes to my planks and attached them to each other using 2.5″ pocket hole screws. I attached the breadboards the same way and I was done! I set the top on the base for photos but waited to get the albatross in the house before attaching them. Before staining the table I sanded everything down really good. This makes the wood take the stain even better. I chose to use Varathane Briarsmoke stain for my table. It’s amazeballs. You will love it. Best color ever. After staining it, I talked my hubby into helping me move her inside so I could get it attached. I used 4″ Spax screws on this part. You can find them at Home Depot or on Amazon HERE. I went through the table base runner and into the table top using 8 screws. After assembling the table I gave the top a coat of Varathane Triple Thick in Satin to protect the it. This stuff has an awesome finish to it. You brush it on and let it dry. It goes on white and dries clear. Whewwwww that was a lot of pictures. For those of you that are still with me, here she is again all finished! I’ve had lots of questions about the centerpiece bottles and vases. The vases can be found HERE on Wayfair. The vintage bottle set can be found HERE on Wayfair. And, let’s talk about the chairs… I’m in love. They are super cheap too! You can find them HERE on Wayfair! The rug can be found HERE on Wayfair. The chandelier can be found HERE on Wayfair. The wall color is Antique White by Sherwin-Williams. The window panels can be found HERE on Pottery Barn. The bench plans are coming soon! Thank you! I would SO appreciate you sharing this project with all your friends. Let me know if you have any questions at all! Looks great! I may consider doing 2×6 on the bench top too it looks pretty nice. What color stain is that? I really like how the briarsmoke turned out on my table, but your color looks really nice too. I would love to know the stain you used as well! It is Minwax Special Walnut. I thought you said you used the Varthane Briarsmoke on the table. I am confused as to which color of stain is pictured in your final photo? Also, it there a reason you did the clear coat inside, after it was assembled? Thanks! Sorry I might be missing something but the bench plans link is no where to be found. I know it’s been a long time and chance I could get a plan link. Thanks!! I am attempting to build the bench tomorrow using 2x4s. I think the structure of the base of the bench is very similar to the table in that you build two of the “bases” and connect them using the legs. I’ll let you guys know how it goes! (I wanted mine in time for Thanksgiving, too. 😉 Love love love how the table turned out! I’m doing the same. I posted my abridged plans a little below. I’d be interested to know how closely your plan matches. Yes! Triple thick matte finish! We use the satin finish and the sheen is very low. I really don’t get why it’s taking so long to get these plans:/? any chance you guys can post the bench plans soon….im trying to finish before Thanksgiving? same exact question lol. I’ve guessed at the plans but I feel like I’m missing something important structurally not seeing the underneath of the benches. Looks like 2×4 instead of 2×6 and 1×4 on the ends, but that could just be what I’m seeing and not reality. Bench top is 5 2×4 deep, then one 2×4 ripped in half long ways as the end-caps (breadboards on table). That makes the bench 15″ deep, pretty standard seating depth. These are all assembled using wood glue and pocket holes in a similar pattern as the table top. Length of bench boards would be approximately the same as the table, though that’s probably somewhat up to asthetics if the bench should be exactly the same overall length as the table or slightly shorter. Remember the half 2×4 end caps will contribute 3″ to the overall length of the bench. This also means that if you are matching the length of the bench to the table the main 2×4 of the bench top will have to be 4 inches longer than the table top 2x6s. So if you built the table to spec (8 feet long) the bench 2x4s would be 78″ instead of 74″. In another one of their tables they made the bench the same length as the table so even though the perspective of the photos make it seem like it may be a bit shorter, I’m just going with same length. The bench base is less complex than the table base as it’s just a single layer of 2x4s instead of a double layer. For the primary “feet” of the bench I’m going to make it follow same ratio as table 75%, so the two “feet” at each end of the bench will be 12″ (rounding up from 11.25″ just to give it a a little more stability). The distance between the legs of the bench appear to be further than the table so instead of a 50.5″ middle brace it would be maybe 12-14 inches more. I’m going to go with 64″. Then the brace end-caps look like they are 4″ with a 45 degree notch cut off the outward facing top edge and looks to be about 3/4″ deep. The legs would be 13.5″ to make the total bench height 18″ (18″ bench height for a 30″ table is pretty standard). The base would be replicated on top of the legs just like the table and that’s what the bench top would be attached to. Now I’m a little skeptical of the orientation of the 2×4 legs being enough to withstand the horizontal pressure coming from people sitting down and moving. I could be wrong, but when I get done building it i’ll give it a test to see how well the 4 2×4 with 2 pocket screws do holding it to the base and 2 holding it to the top. I’ll report results here. To stand on your shoulders, I’m thinking of using a half lap joint to connect the horizontal parts of the base, screw the legs through those horizontal pieces (to avoid seeing pocket holes) and optionally nail in foot pads. when are you bench plans coming? Just finished this table for our dining room! Now I’m just waiting for those beach plans!! I hope y’all post them soon! Need those bench plans!!!! Come on ladies your slacking..
REALLY love this table!! Are the bench plans available yet?? I would like to build it for thanksgiving! If I didn’t have a table saw, Could you rip the rounded edges off of the 2x6s with a handheld planer or would it not turn out the same? Bench looks relatively simple, but anyone have thoughts on how to attach the legs to the base? Seems like simple kreg screw attachment would be too weak. Absolutely love this project, started on mine this weekend. modified it slightly to fit our needs, 120″ x 48″ the plans make it so easy, you ladies rock! So how soon can we expect to see the plans for the benches? Would love to know the project list for 120″, that’s the size I need. this is awesome and I’m HOPING a true “beginner” can figure it out! Would it be possible to make the table height slightly higher to accommodate someone with special needs? If so, what would that change in the plan? Thank you! I noticed you only used eight 74″ wall studs for the table top instead of the nine in the diagram. Does that mean I only need 16 wall studs instead of the 17? Also, at some point, did you cut the leg runners to 3 1/2 x 3 1/2 instead of the 4″ x 4″? a 4×4 is really 3 1/2 x 3/12 in size so there should not be any need to cut them down. We are in the middle of building it and can’t figure out where that 9th 2×6 cut to 74″ goes either or the 9th piece cut to 12″with a 45 degree mitered end. Were thinking that must be a mistake in the plans. Do you not use wood conditioner prior to staining since it’s pine? You’re stain job looks great; mine always looks funky if I don’t condition the wood first. Super cute!!! This is like the table I’ve been eyeing for our dining room!! But first, we have to make our kitchen table…Oh the list just grew even longer! How would this hold up outside with the Varathane on it? Think it’d do okay? Would you be able to do a SUPER beginners table? I only have a hammer and nails (sad I know)! I saw the prettiest table and HAD. TO. HAVE. IT. So, in typical fashion, I started planning. Here is how she turned out! 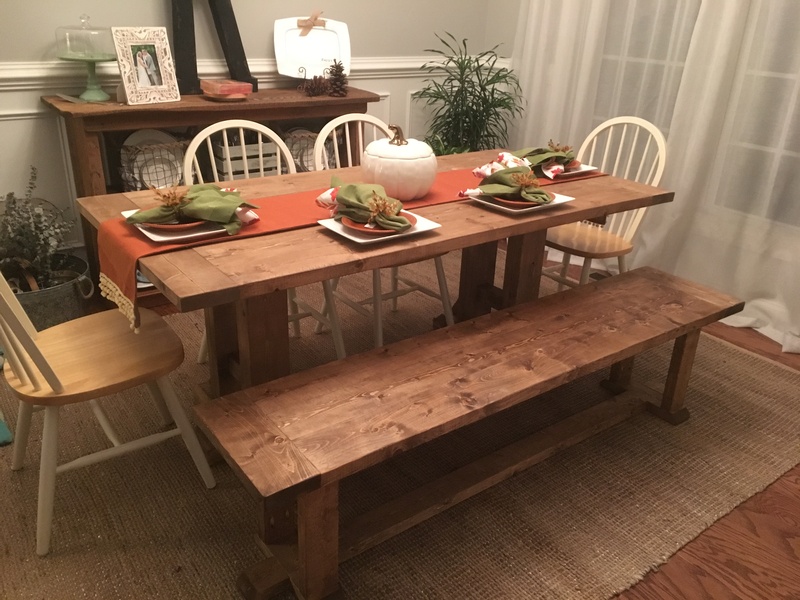 Check out my Pottery Barn Inspired Dining Table!